The Northampton Arts Council is pleased to announce the opening of our ArtsEZ 2019 SPRING GRANT ROUND on April 17, 2019 with a deadline of May 17, 2019. Individuals as well as schools and arts organizations are encouraged to seek funding for creative projects to be held in Northampton, Florence, and Leeds. The grants are funded by the proceeds from the Arts Council’s signature events: The Silver Chord Bowl, Transperformance, and First Night Northampton. Last spring, the Council awarded $20,000 to 27 recipients with grants ranging from $250-$1,250. 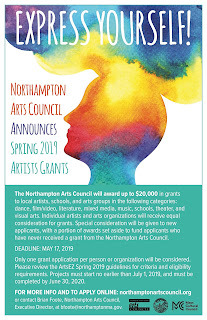 This spring the Northampton Arts Council will award up to $20,000 in grants to local artists, schools, and arts groups. Grants will be awarded in the following categories: dance, film/video, literature, mixed media, music, schools, theater, and visual arts. Individual artists and arts organizations will receive equal consideration for grants. Special consideration will be given to new applicants, with a portion of awards set aside to fund applicants who have never received a grant from the Northampton Arts Council.